The public is welcome to attend any of our services–Mass or the Divine Office–in the Santa Rita Abbey church. Sunday Masses at 8:00 a.m.
Our Franciscan friend from San Xavier Mission celebrates Sunday Mass in our chapel each week. 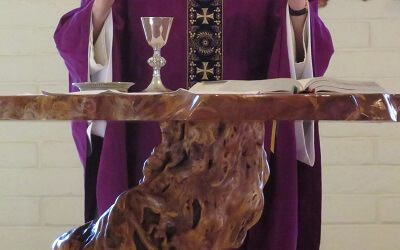 A priest of our Order will be in residence, so we will have Daily Masses at 7:30 a.m. as well as Sunday Masses at 8:00 a.m.
Sunday, April 14, 2019 – Palm Sunday Mass at 8:00 a.m.
Thursday, April 18 – Evening Mass of the Lord’s Supper at 5:15 p.m.
Friday, April 19 – Solemn Afternoon Liturgy at 3:00 p.m.
Sunday, April 21 – Easter Vigil begins at 2:30 a.m.
Sunday, April 1 – Easter Day Mass at 8:00 a.m.
Monday through Saturday at 7:30 a.m.
St. Theresa’s in Patagonia and Our Lady of the Angels Mission in Sonoita. 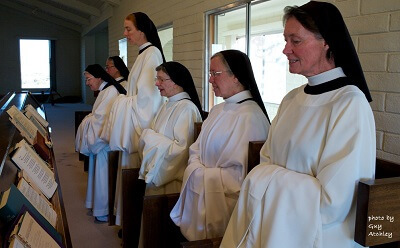 Please join us in praying for more vocations to the priesthood! Tierce & Mass begin at 8:00 a.m.
Vespers is at 5:00 p.m.